Clean waters are important to people who fish, swim, and boat in the river and to the animals and plants that make it their home. Broadly speaking, water quality is the chemical, physical, and biological properties of aquatic environments. Good water quality has different meanings, depending on whether parameters are evaluated against standards for human contact, drinking water, or healthy ecosystems and aquatic life. ICPRB was established in 1940 for the specific purpose of solving the Potomac’s water pollution problem. While the worst pollution issues of yesterday have been addressed, today’s pollution concerns focus on restoring and maintaining the chemical, physical, and biological integrity of the basin’s waters. The United States Clean Water Act of 1972 and subsequent laws call for these same efforts. ICPRB’s water quality-related efforts fall into three categories: measure, analyze, and plan and act. 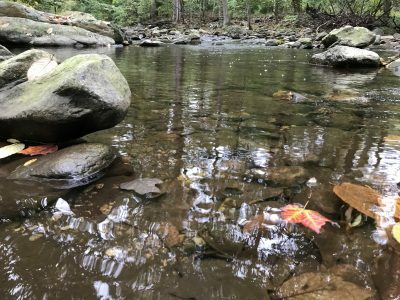 ICPRB actively collects water quality and habitat data in several Potomac River basin watersheds. Through the Chesapeake Bay Program (CBP), we help manage and update very large databases of monitoring data collected by state and federal agencies. Data are any kind of systematic measurements or information. Water quality data can be measurements made in the field, water samples collected in the field and analyzed in the laboratory, or information extracted from other data sets or geographic information layers. ICPRB analyzes and interprets monitoring data to address the information needs of our stakeholders. ICPRB also models and integrates information across scientific disciplines to create a holistic understanding of how human activities and natural ecosystems connect. Many of ICPRB’s technical projects involve assembling and analyzing data and information collected by other agencies. Data quality assurance and quality control are important aspects of our work. ICPRB staff is developing a suite of R programming code to analyze water quality trends and graph the results. Several members of ICPRB staff have technical expertise in running a variety of watershed and water flow models. ICPRB assists Potomac basin states in establishing water quality criteria and TMDLs. Water quality criteria refer to the concentrations or levels of a water quality parameter that are desired for the identified “designated use” of a waterbody, including drinking, recreation, farming, fish production, propagation of other aquatic life, and agricultural and industrial processes. You can learn more about water quality criteria, TMDLs, and designated uses from the U.S. EPA. TMDL stands for Total Maximum Daily Loads, and refers to the maximum amount of a pollutant that can enter a river, stream, lake, or estuary and still allow it to meet the water quality standards set for it by the state and the federal government. TMDLs are necessary when a water body does not meet standards even after standard pollution control technology has been installed on all regulated dischargers like wastewater treatment plants. To determine a TMDL, all current sources of a pollutant must be identified, including non-point sources like stormwater or agricultural runoff. Usually, a computer simulation model is used to explain the link between current pollutant loads and observed water quality, and to predict by how much the loads need to be reduced in order for the water body to meet water quality standards. ICPRB provides educational material to the general public on key issues regarding the Potomac watershed. We cover a variety of topics that are important to the Potomac and its residents. Our Educator Resources page is full of lesson plans, professional development opportunities and other resources for formal and informal educators. Our Watershed Activities to Encourage Restoration (W.A.T.E.R.) program is a compilation of simple, low-cost projects that your organization can use to help protect and restore your watershed.